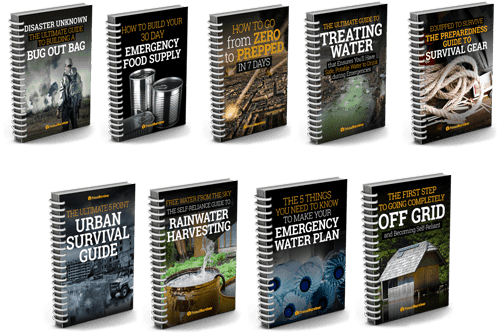 These “what if” urban survival exercises are fun – like when you figure out that the lint building up in your pockets would make a good firestarter or you could make rope from plants. But let’s be honest: Unless you are McGyver, a bit of lint probably won’t save your life. If you want these “what if” games to have any merit, you’ve got to use them to better plan your EDC survival gear. Now let’s be even more honest. 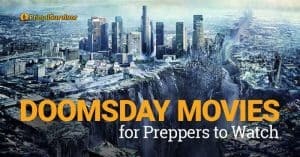 Most people aren’t going to carry around a bunch of EDC tools on the off-chance that a nuclear bomb might drop that day. Instead, it is better to keep a complete Bug Out Bag in your car and at work (or wherever you spend a lot of time). 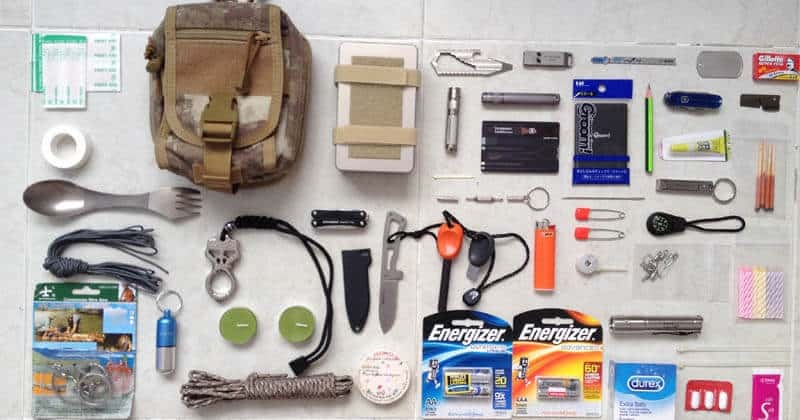 A good EDC kit will contain must-have survival items and items that you actually use on a regular basis. Since everyone has different survival needs, I decided not to give an EDC checklist. Instead, here are examples of real-life EDC kits. Let these EDC kits inspire you to build your own! 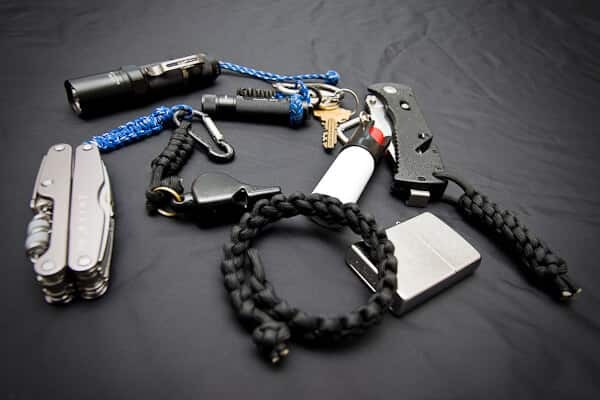 Here is the EDC kit which is most realistic for most people: It contains crucial survival gear (knife, firestarter, cordage…) but not so much that the items won’t fit in your pocket. This is a second-line EDC kit. By “second line,” Jessica means that it is secondary to the stuff in her pockets, such as keys and wallet. Jessica travels a lot, so her kit has items for the field and for entertaining herself in everyday life. She wears the EDC on a shoulder strap or it can be attached to a backpack. This is an EDC kit for someone who expects to flee into the wilderness at any moment (as is evident by the compass, wire saw, and amount of cordage). Most people probably won’t want to carry around this much stuff every day. So, again, this is an example of how you have to choose between practicality and having all the EDC gear you might need. 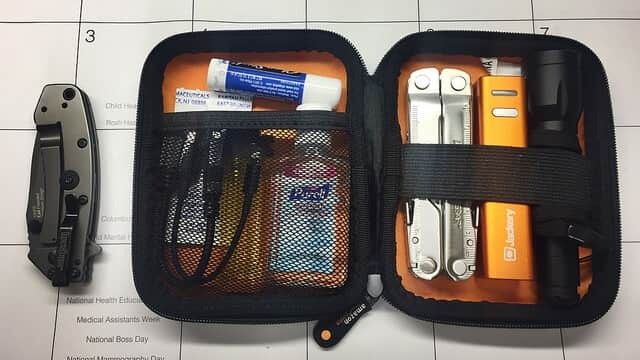 This EDC kit by “Churl” happens to fit perfectly into a portable HDD carrying case. He’s quick to admit that he rarely uses most of the items in the kit (except for the pocket knife) and wonders why he bothers carrying around the case every day. This super-small EDC kit fits in an Altoids tin. There are a LOT of survival items in the EDC kit. But do note that most people wouldn’t be able to survive with just these items – it takes a lot of McGyver-style skills to pick a lock with a paperclip or start a fire with a magnifying card! However, those safety pins, duct tape, and Swiss Army knife will come in handy on an everyday basis. This is a not-quite-pocket EDC kit. The owner carried it around in his backpack every day. However, he admits that he eventually stopped carrying it because it got to be too bulky. 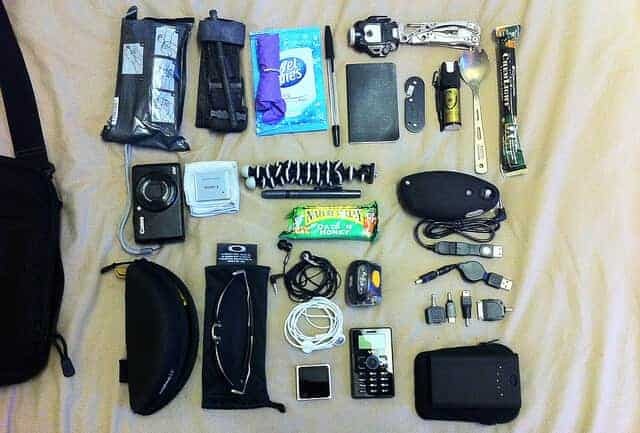 Lots of unnecessary stuff in this one, which just goes to show that, while you may want to get every single important survival item in your EDC kit, practicality still matters. Now he just carries around the duct tape and cash – nothing else. What Do All of these EDC Kits Have in Common? 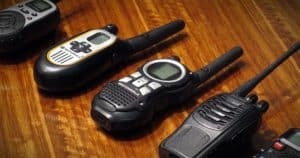 Rather than trying to mimic someone else’s EDC kit or going off of a checklist, it is worthwhile to see what most/all of these EDC kits have in common. Then go off of that for building your own EDC survival kit. What’s in your EDC kit? We’d love to hear from you in the comments. Or join the survival discussion at our Facebook group. every edc kit should have a can opener (p51 or or p38). Nice article, but I think that people really do need some guidelines or even a basic list to follow. 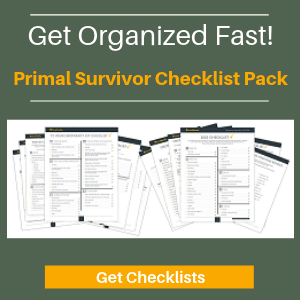 The important point to emphasize and focus on is that your selected items should meet basic survival needs and allow one to take whatever actions are needed in the event of any crisis. Situation may arise where the common items are not enough or we need other things. A compass may never be used since we navigate by street maps, spoken directions or even GPS. 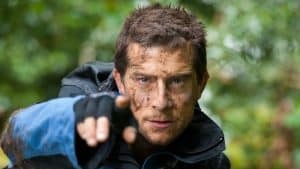 Out in the wilderness, the compass will be THE tool for navigation, so we should learn to use one. Each person will have to choose whether or not to carry more stuff and what to pack. A knife and flashlight are great, but if you were forced to hideout, you’d probably enjoy a tarp, an MRE and a pocket stove in a small pouch and that spork you carry. Again, you know that some items are in your kit are only there, because you might need them if there was a big emergency. The question to consider is if you want to keep a minimal EDC kit, expand it to meet other needs or have a bigger kit someplace else and just have a few items tucked into your pockets. I lean towards a waist pouch or fanny pack and a more capable and versatile kit. This made me think, “what is in my bag that would be useful?” So I had a look. Here’s what I found: sharp pocket knife, emergency whistle with built in magnifying glass, signal mirror, and signal light plus a space for my water purification tablets, small led flashlight x 2, strong plastic fork, coffee stirrers( kindling) magnifying card, cash, personal alarm, bottle of water, polo mints, pain relief, pad of paper and pencil, pen, pack of tissues, antiseptic wipe and bandaid. That’s my unplanned stuff in my handbag. Not bad huh? There’s usually a small sewing kit and a lighter or matches too. That’s a decent kit there Diana. Has anyone got anymore? I have a bandana and always carry water purification tablets with me. They’re tiny, and I can fit 6 in the empty space in my emergency whistle. The whistle also has a compass, signal light, mirror, magnifying glass and tiny thermometer in it, all on a parachord neck string.. I got it at Mountain Warehouse. Tiny, yet mighty! Hi, I must have seen thousand of these EDC kits and these are super amazing. One thing I have never or rarely seen in any kit is a backup phone. Something like the cheap Nokia basic with nearly 20 days of backup also pretty small in size and weight. In today’s world network coverage isn’t one important also weights nothing. Would come really handy in a situation one need to be contacted or to contact when the fancy smartphone run out of juice in 12 hours. The challenge lies in keeping it charged, if you can do this then would be a good addition no doubt. I decided to do a “pocket dump” because I tend to not think twice about what I edc. I get to wear cargo shorts for work, so I have multiple pockets to store stuff in. Contents: Bigger pocket knife, small Swiss Army knife, on my key chain, whistle, p-38 can opener, Chums multi-tool similar to Nitize Doohikey, a key-knife, and an eye glasses cloth. I have what’s sometimes referred to as a booboo kit: self made first aid kit with band aids, pain meds anti biotic cream pouch and a small mole skin, two lighters one wrapped in duct tape and the other in electrical tape ( yes I’ve had situations where I’ve actually used the tape), bandana and of course my phone. Cool pocket dump and some nice edc there. I think I may be over-carrying a bit. 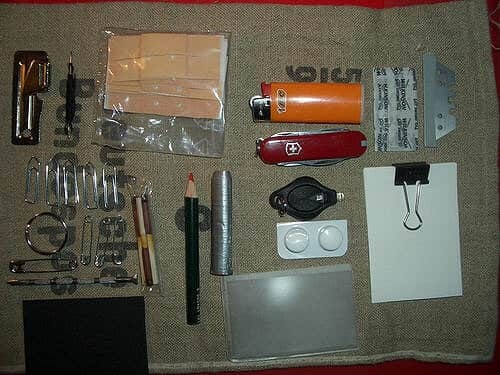 In my cache belt, I have a Victorinox bantam (knife, a bottle opener, can opener, screw driver), a 130-lumen 10180 flashlight, water purification tablets and water container, split pea lighter, a fire starter, some cotton with petroleum jelly, a set of lock picks, large band aids, a couple of iodine and alcohol wipes, and a compass. 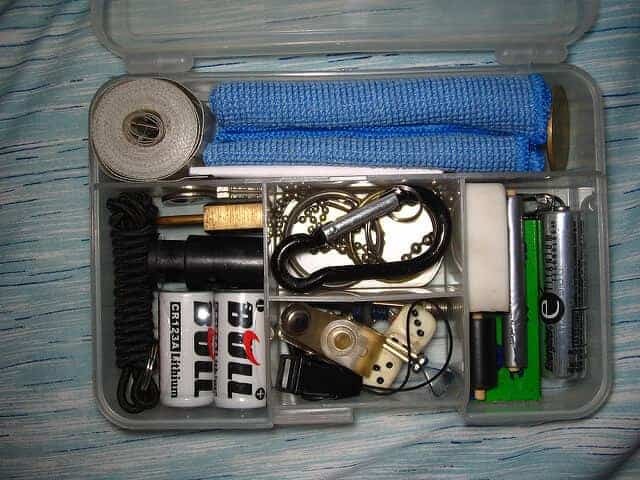 In my belt pouch I carry an Olight S2A Baton, some duct tape, extra AAA and 10180 batteries, and a small sewing kit. In my pocket organizer, there’s a Gerber EAB Lite, a Leatherman Squirt PS4, a Surefire Titan Plus and a cheap small fixed blade. My paracord bracelet has a small multitool, fire starter, compass, thermometer, cotton tinders, ranger bands, fishing kit, and whistle. As for my necklace, I wear a Victorinox Classic SD Alox. Some quality gear there. You do carry a lot but all your gear is wearable, so shouldn’t be too hard to manage. Interested to hear what others think of this setup? 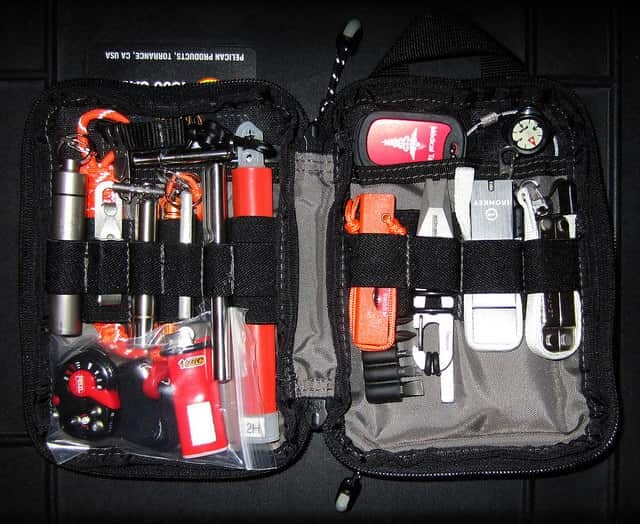 I love reading what everybody packs into their own EDC kit, they are all very inventive. And some very cool gadgets, which, as a bloke I’ve drawn to! However, I don’t have an edc. I’m a tradesman with a truck load of gear. Got everything I need to get through in that. LiteLoad compressed towels-Good for wiping off sweat, dust, or for first aid, weighs nearly nothing. Leatherman CS and PS mini-multitools-Scissors in the CS, Pliers in the PS, with the PS being TSA approved. One of these along with a bit of cordage, a whistle and pen comprises my suburban survival kit. Also there’s a tiny flashlight and a $20 folded and stashed into a nitro pill container. Sensible additions Carol. Thanks for the comment. Tape measure, magnifier card, back up charger, flashlight, and a pen. I have a little bit more room in it and been working to figure out the best way to carry a lighter or other fire starter besides the maginifier. Since I work outside getting to my truck is generally pretty easy which contains more of what I might need in case of a full blown emergency situation. Nice sounding kit there Chris. Thanks for sharing. 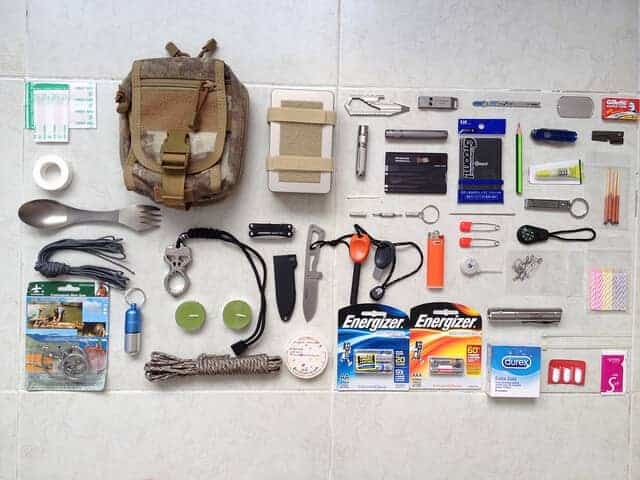 Knife, flashlight, smartphone, keys, multitool, duct tape roll, first aid kit, iphone ear buds, bandana, tissues, paracord, tampons (for tinder) and a small compass. 1 complete layer of clothes incl. gloves, bigger first aid kit, candles, map of my area + 30km radius, pen, paper, powerbank, USBdrive with all family photos (in case home burns down), CPR mouthprotection, spork, fork, spoon, permanent marker, another flashlight, drugs against motion sickness, lip balm, sillcock key, hand sanitizer, a hygiene kit (shaving tools, toothbrush + paste, mouthspray etc for those last minute business meetings), another (better) compass, waterproof matches, roll of trash bags, headlamp, a water bottle and pepper spray. Very thorough kit you have there Arctic Fox.